Watch as we actually plant a Rose! NEW: See a short tutorial on how to trap those pesky gophers and moles. 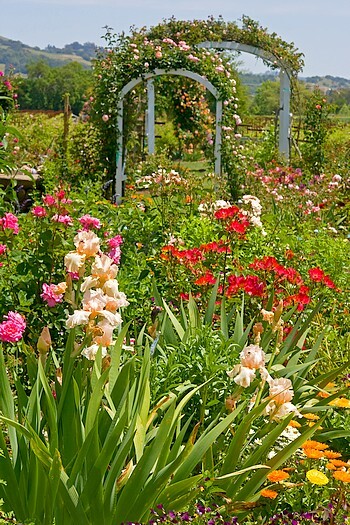 Take home informational handouts and irresistibly beautiful roses, irises and perennials from our brimming nursery. "Glorious Irises of Spring - The Garden Awakens!" Just when we need a bit of color in the garden, the irises begin their glorious spring show! Enjoy 200 varieties of these gorgeous beauties in full splendor, many of them world-class award winners, planted throughout the 650 roses in our garden. Drought tolerant and easy to grow, Jan calls them "Orchids You Can Walk On". And, the beauty continues to unfold as our early blooming roses take center stage. Enjoy the huge 'Lady Banks' rose from 1820, the rare mystery rose 'Hearts Desire Pink' and the sublime Souv. de Mme Leonie Viennot from 1898 spilling over a 12' x 12' arch. Ah, the Glory Begins! Special tours at 10 am & 2 pm. Our homage to Monet's Garden! A Magnificent Tour of more than 75 varieties of climbing roses in Full Bloom. Meander down the Rose Alleé, an avenue of 12' arches holding 30 cascading climbers. What a sight! What a fragrance! We'll offer Tips on selecting, growing, training and pruning these majestic gems. Also, enjoy our secret garden treasures: "the Purple Playground", the "Humming Bird Wall", "Hollywood and Vine", "Kitchen Garden" and see California's ONLY Perfume Rose Fields --- in Full Bloom!. Nursery brimming with an irresistible selection of climbers available in nursery. Nursery & Garden Open 10-5.